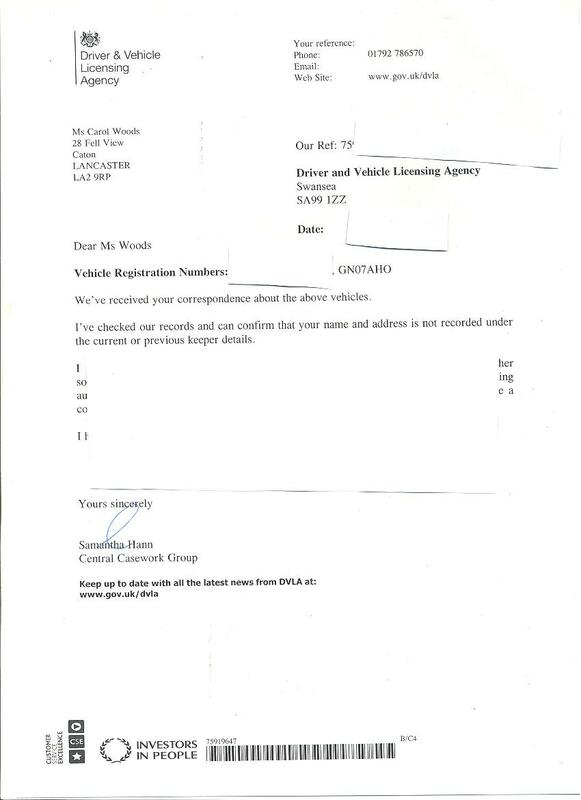 Please note that since the main 15 June '18 updates were uploaded, the message directly below entitled E-CRIME and ID THEFT / ID 20180 1889 was received - relevant to the irregularities regarding Carol Wood's electricity / phone / Internet broadband and more. To explain, when Carol went out one day in the distant past, her Internet router, and phone connection apparatus were rewired and placed into her loft, way out of easy reach, and are not in the normal positions one would expect these objects to be in one's home. My broadband Internet router, for example, and the landline phone junction / connection box with the input / output cables for my landline phone + router etc. go into a wall socket in the corner of my room, as is probably similar for most households. In Carol's case, the router and phone junction box has been rearranged and put in her loft, so Carol can't turn them on or off, for example, and stop the shenanigens of them being misused. Carol had her laptop confiscated anyway, and the computer was hacked anyway at her address so there was no point in having one, and she has no landline phone either as it's impossible for her to have one in her dire circumstances as a Targeted Individual, so the only people using her Internet connection, and landline phone apperatii are her highly questionable neighbours, and these objects have been rewired to go to these criminal neighbours homes from Carol's loft. This way it makes it seem Carol is using the phone, or using the Internet when really it is not her at all but these "neighbours" - the very same who have been receiving her misdelivered mail for ages, from which they get her ID to do whatever with, along with being involved in countless other crimes [ridiculously strongly alleged]. The rewiring and moving into the loft of the phone junction box + Internet router was rearranged when Carol was out one day some time ago - and when she came back home she saw, to her amazement, an ironing board leaning against her front room interior wall. Amazed, she duly moved the ironing board to put it back to where it had been taken from, and saw, on the wall and written in pencil - the circuit diagram for the rewiring of these objects. We can surmise that whoever drew those recircuiting diagrams may have been explaining, at the time - to an electrician or whoever - exactly what was to be done and how it was to be done, before the acts took place. Since that day, "ironing boards" have been deliberately and bizarrely left in streets Carol drives her car down to get to wherever so she can see them and be reminded of the lunacy she is forced to endure, and also what they can get away with, literally in broad daylight. This is what they do = it's basic predictive programming, a form of mind control [if you let it be]. 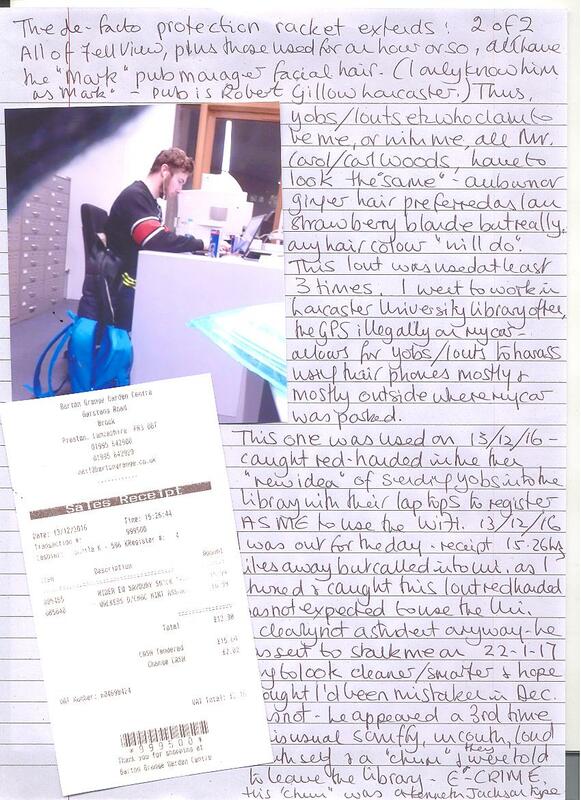 The dubious neighbours have been misusing Carol's feeds into her home for literally years to do whatever with - ID frauds included, by placing orders for expensive goods [all paid for by the taxpayer] using the fake phone connection or broadband in Carol's loft. 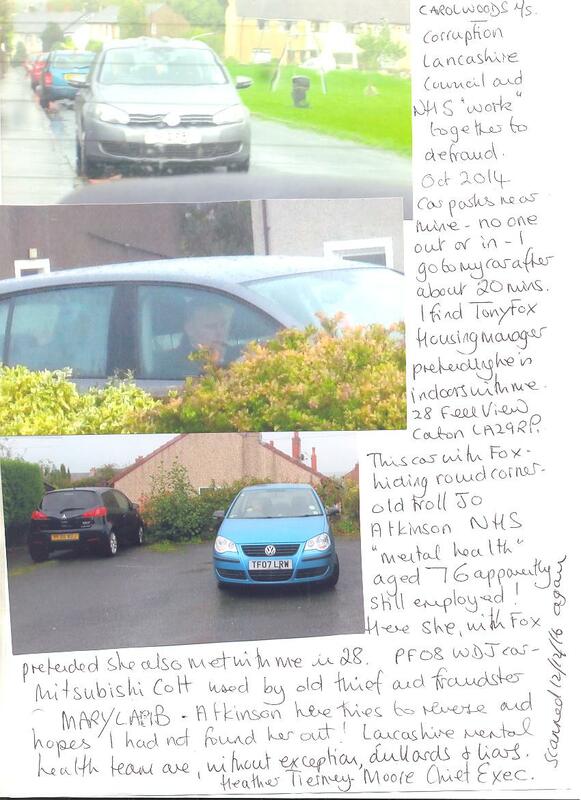 If the previous updates are read it will be seen reported that countless delivery vans or couriers such as the "DPD" delivery service are constantly turning up at regular intervals delivering goods to these neighbours - many of them are in on it, and perhaps these goods are the reward for the stalking and other acts they do against Carol - there is so much to report about what these crazies get up to it's unbelievable. Carol states also she has recorded by way of numerous photos taken of these numerous delivery vans - these deliveries also going back a long time. Of course, were any official investigation to take place regarding any of what is reported above everything concerned would vanish literally overnight, or even earlier rendering whoever made the claims of impropriety or crimes committed a complete liar and mad person. Anyway, what's more, when the router or phone are being used, they emit a strange noise which Carol can hear and has recognised and got used to - she can note instantly when these dubious neighbours are using these connections to commit criminal acts or whatever - eg. ID frauds taking place, it is very strongly alleged. The neighbour directly next door steals the electricity too, as the walls are paper thin and they can hear easily Carol's putting of plugs into sockets, or simply switching a socket on ready to use something - a radio being turned on, for example, tells the neighbour Carol's electricity is on and running, and then they then go into action and hack and steal Carol's electricity accordingly, for whatever reason, if only to pester and annoy, until Carol turns it off again, even though, of course, they have their own electricity anyway. This is no way to live, with no authority doing anything about any of it when reported, but this has been the situation for years, incredibly, and part of Carol's being targeted by neer-do-wells in authority positions! 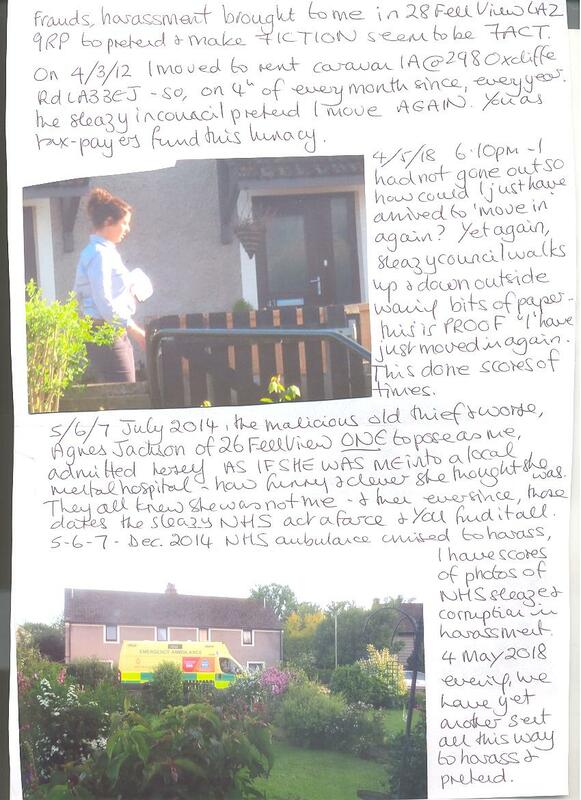 28/5/18 and Jackson in 26 Fell View ONE who poses as me,bangs on the party wall, 'they' have a PLAN to “see me off”. 8 45am. Those in 30 crash and bang about at the party wall sockets same time. Loft at 10 24am from 41 or 45? 10 29 it was 30, 10 35 it was 41 or 45 again, 10 42 it was so loud it was if the ceiling would cave in. Williams screeches into her phone outside at the rear, sounds rough, 10 51am. Sounds like Rycroft did. MO11 was used to be FE11 again, 8 04pm and loft with TV off in 30 as she can’t have TV in background if she is me on phone. Then it goes on so computer use. 8 09 so my power was off. It had been off from 4 10pm. 8 11 and the sounds moved to 34 then back to 30, so links between the 2 which I guessed months ago. 8 26 loud link 30 to 34, 8 45 still goes on at 34, TV back on in 30, found out TV off and phone use, TV on and no phone use. 8 47pm and back to 34 loud, 6 mins to 9 and 9 02, 9 18 loud, out a front a few minutes still heard but not me, I was not even indoors. 9 25 on going and record on Dictaphone, switches to 39/41 at 9 35pm back to 34 at 9 42pm, 39? At 9 48 and 10 12 it was 34. 10 14 it was 39 or 41 again, 10 30 it was 34. My power back on almost 10pm. My power is off most of every day as my power was was ILLEGALLY linked to 30 along one party wall and to 26 along the other party wall so that Jackson in 26 could use her power which I paid for and Williams in 30 could use hers which I was to pay for BOTH HAD TV's which they used at least 14 hours a day as if it was my use. The tapping on the wall was because of the attached where I found out about the power and the Gestapo had to send one to "decommission" the devices in 26 while they thought I had not known about 30 Fell View. Today, I found ARROWFIX waiting at 23 Fell View, Clarke unemployed, the child abusers who claim to be my brothers and claim I live there being driven about by them which delivery was NOT made as I was not out so nothing could be done behind my back. The Masonic thugs organise all this and the delivery drivers know EXACTLY what they take part in. THE MOTIVE IS TO PRETEND I HAVE A PHONE AND PLACE ORDERS. Naturally BANK FRAUD is involved so now another round robin goes to all banks with a note to watch for ARROWFIX invoices paid. As this is for another agency, I add the FACT that this morning a chemist supply van arrived to 23 and pretended to deliver there when he did not alight either. After Arrowfix, ANOTHER medical supply van arrived and the same again YOU FUND ALL THIS LUNACY. I am to be said to be "ill" and in 23 being cared for and driven about by child abusers (all reported to Gestapo, all ignored as they in 23 were SET UP to be SOME ready for my move to 28 Fell View with FRAUD ID THEFT and FORGERY etc in mind. Thus back to my record Loft Noises and comment that they link to each other (all unemployed, all bullied to death the former, elderly lone occupant of 28 because it was wanted for me for these reasons) BLENKINSHIP in 34, (druggies etc there and one who they all pretended was my daughter calling on me as if I lived there AS WELL AS AT 23 and others and as that loud, foul mouth druggie was "blonde" I have been hounded all week with similar types all using their phones as PROOF that druggie was my daughter as a "blonde" was to be "seen" near me! WILLIAMS in 30 is actually me - apparently, as is JARVIS in 41, and others. ALL caught in E-CRIME and more and ignored when reported. Almost 2 weeks ago, at 9pm I heard the loft noise which told me WILLIAMS made a phone call from 30, my rear door open for the hot weather, their rear door open for same reason. She had turned off or at least down the TV I had heard; she steps outside usually to make a call as me as I have no TV so if one is heard in her call then it is clearly not my call. Now she just turns down the TV sound for the few minutes she makes the call. Thus I step out and she does not hear so continues her conversation; she was engaged with others EXACTLY as I guessed and she was pretending to be me. Thus they ALL wish to claim that I am in touch with all of them and thus they claim to KNOW I use a phone when I have no phone and would not want to say even "Hello" to such lowlife thieves and fraudsters let alone ring and chat to them. 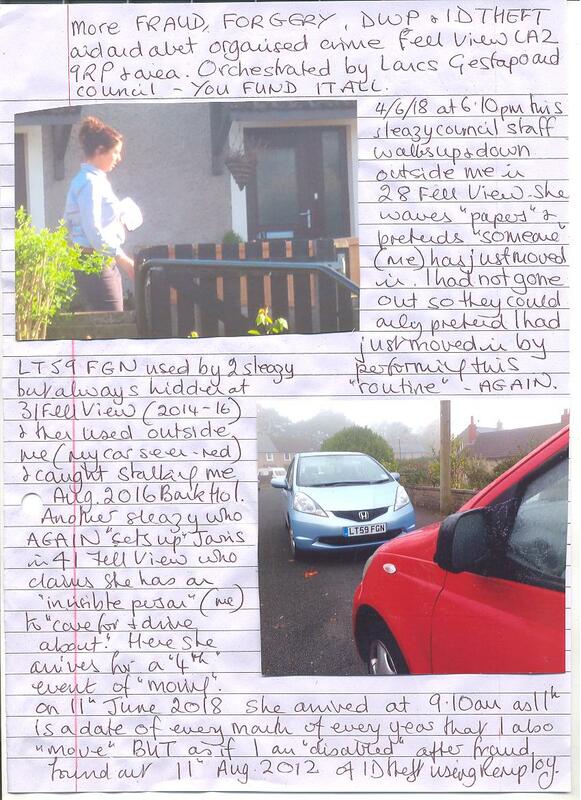 today AGAIN I found the fraudster and deluded thief in 39 Fell View Mrs ANGELA O’CONNER, who claims to be ANOTHER “me” as at least 24 make the same claim round Fell View where I rent 28, a council bungalow. 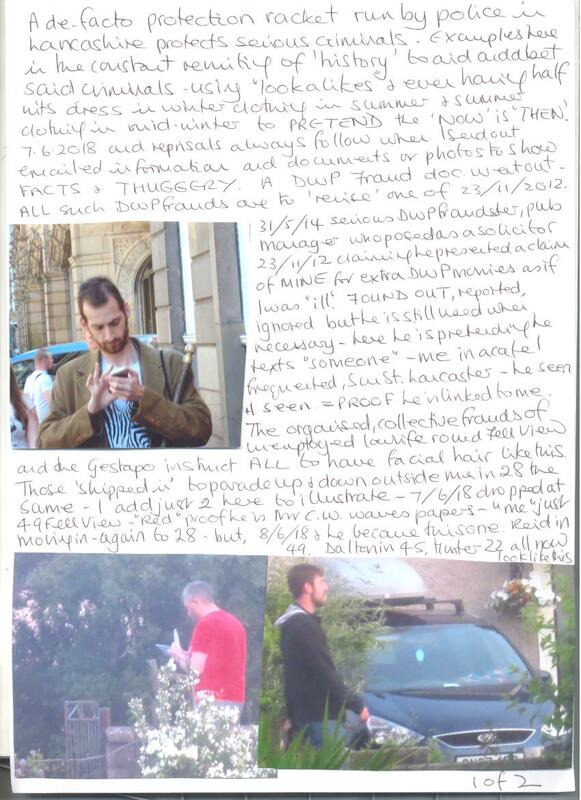 Apart from the other serious crimes connected to Carol Woods case[s], which include disappeared elderly ladies, treason, murder and attempted murder [and so much more] the monetary value alone of the ID frauds using Carol’s name, and variations of her name [“Carol” with an “e” added – as in “Carole Woods”, or a “Carol Woodes”, or even a “Mr. Carol Woods” etc.] must run now into hundreds of thousands of GB pounds – all at the UK taxpayers expense. 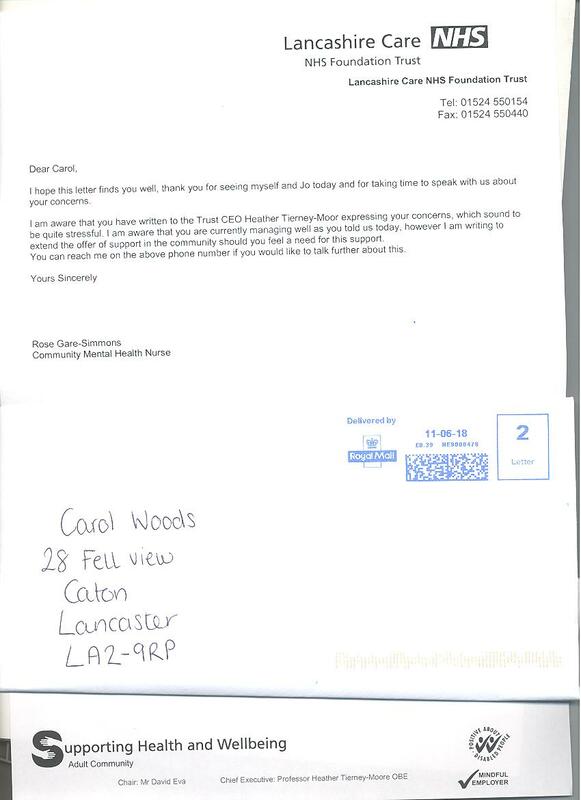 Carol Woods = “It is a highly complex matter which the police organise where they try to make me someone I am not. 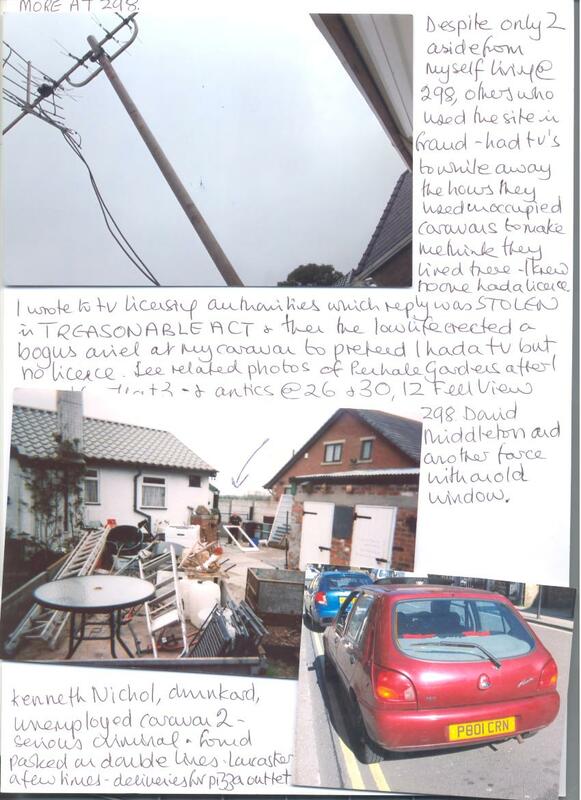 They have in fact tried to invent me as the reverse of myself using numerous characters, including “neighbours” who live alongside myself, and others elsewhere – the entire situations going back years. I find things out because I am not stupid. 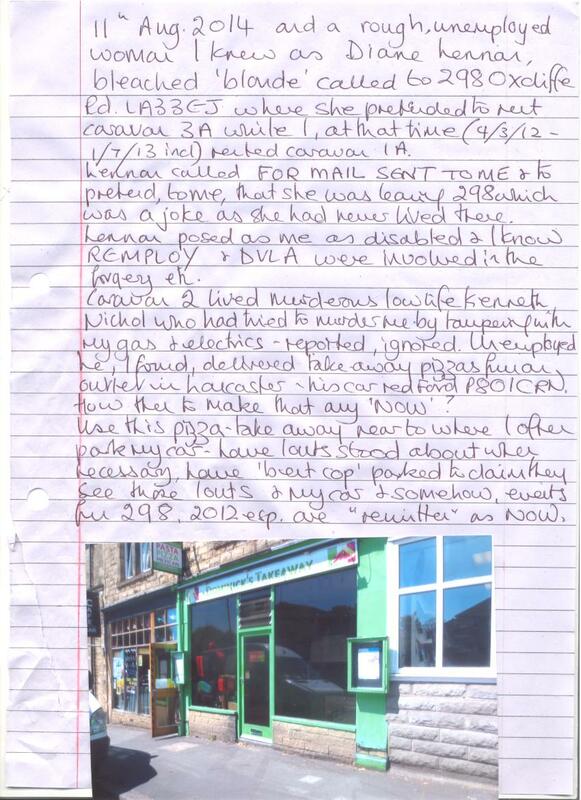 See my original w’blowing blog York LGO Blog re Lancashire CC http://criticalreader2006.blogspot.ae/ you will see why I am hounded by lowlife RECRUITED to do that by the Gestapo. More is described here: “Harassment as punishment for whistle-blowing: Lancashire” http://criticalreader17.blogspot.co.uk/2017/02/ "